I might have a new dark chocolate obsession with this recipe. Not like I wasn’t already obsessed with dark chocolate in general but this, this one is really awesome. 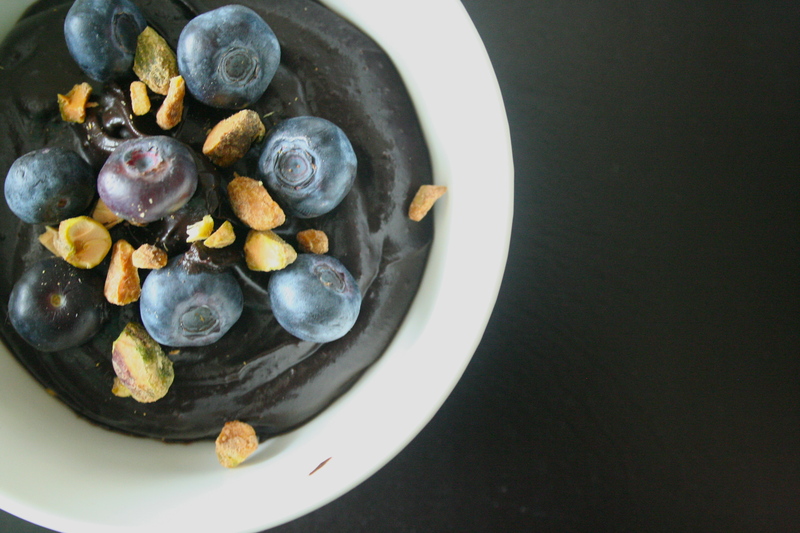 This is a truly decedent dessert that is also really healthy! If I didn’t know any better I would have assumed it was made with loads of cream and mounds of rich buttery goodness…fortunately that is not true and it still tastes just as sinfully delicious. 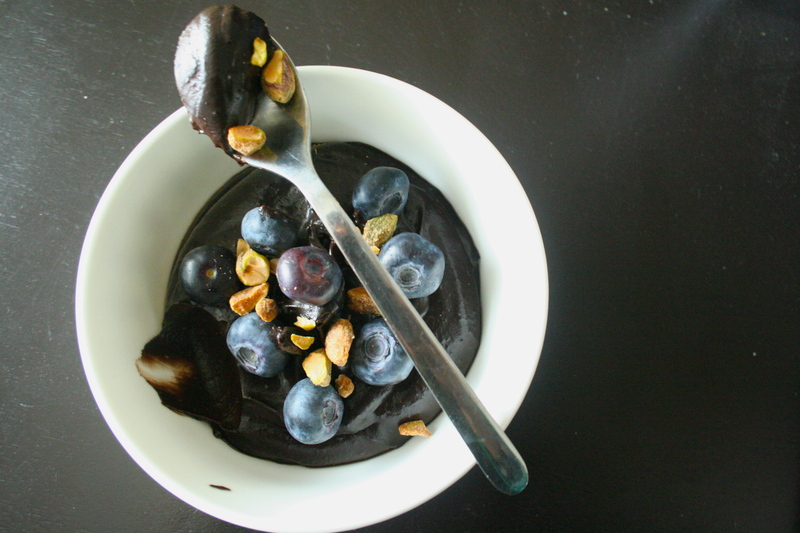 As far as dessert goes this chocolate pudding is packed with healthy fats like omega-3’s and full of antioxidants. To start, avocados are an amazing fruit. If you haven’t added it to you diet yet, you will want to after hearing this. Not only are avocados incredibly versatile and delicious but they also pack quite the nutritional punch. Avocados provide nearly 20 essential nutrients, they are rich in healthy monounsaturated and polyunsaturated fats (such as omega-3 fatty acids), vitamins A, C, D, E, K and B vitamins (thiamine, riboflavin, niacin, pantothenic acid, biotin, vitamin B-6, vitamin B-12 and folate) — as well as potassium and fiber. Avocados have been shown to be beneficial for cardiovascular disease, regulating high blood pressure, high blood sugar. They have also been shown to aid weight loss (Bergh). Dark chocolate also contains some great health benefits (not like I needed any more convincing to eat it). Dark chocolate contains antioxidants that are believed to help the body resist damage cause by free radicals that are formed by normal bodily processes. It also contains flavanols, which may have influence on cardiovascular health such as lowering blood pressure, improving blood flow and making platelets less sticky and able to clot (“Health and prevention,” 2014). So there you have it, a delicious, healthy, gluten free, dairy free, and vegetarian (easily made vegan by replacing the honey with agave) dessert. 3-4tbsp Honey, depending on the size of the avocado and how sweet you like it. 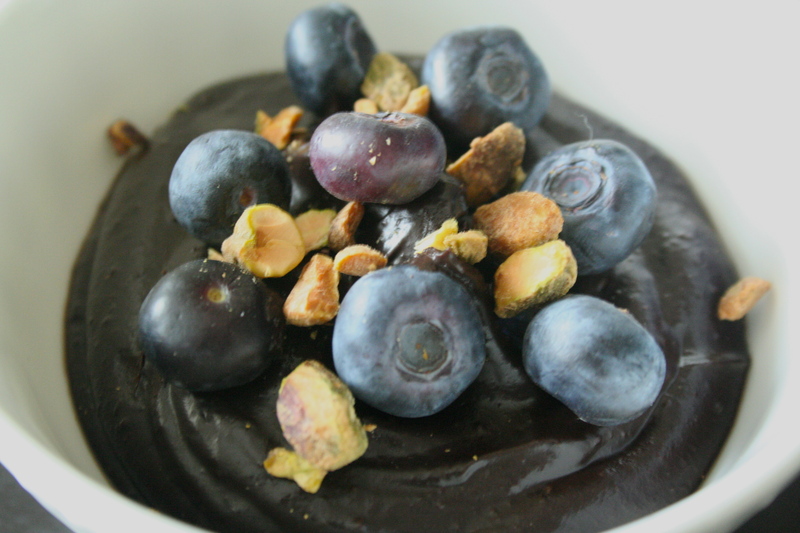 (optional) blueberries and pistachios for topping. Combine all ingredients in a blender or food processor till smooth. Serve immediately or refrigerate till chilled and serve topped with fresh fruit and nuts of your choice.